In an increasingly complex healthcare market, many independent pharmacies find themselves in a continuous battle for the sustained health of their businesses. Common business and financial challenges can significantly impact the bottom line. A strong market position requires access to preferred networks, buying and negotiating power, improved operational efficiency, and adaptability to market changes. But equally critical — and becoming ever more complicated — is the relationship with the customer. For decades, independently owned pharmacies have maintained a reputation for locally rooted, personalized service that couldn’t be matched by large chain pharmacies. In recent years, however, national chains have begun to put a premium on spending more time with patients to enhance care delivery, consumer experiences and patient outcomes. For today’s community pharmacist, dedicating more face-to-face time with patients is no longer just a service ideal — it is now an operational necessity to stay competitive in market, even against national chain rivals. How does an independent pharmacist balance the many tasks of running a business on the back end with the need to provide even deeper levels of customer care on the front end? 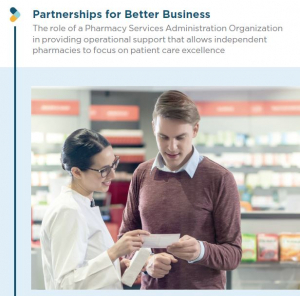 The challenge will seem herculean, unless the pharmacy partners with a high-functioning Pharmacy Services Administrative Organization (PSAO) that solves pharmacy issues and streamlines pharmacy operations. In this white paper, we will explore the link between PSAOs and pharmacy customer service.